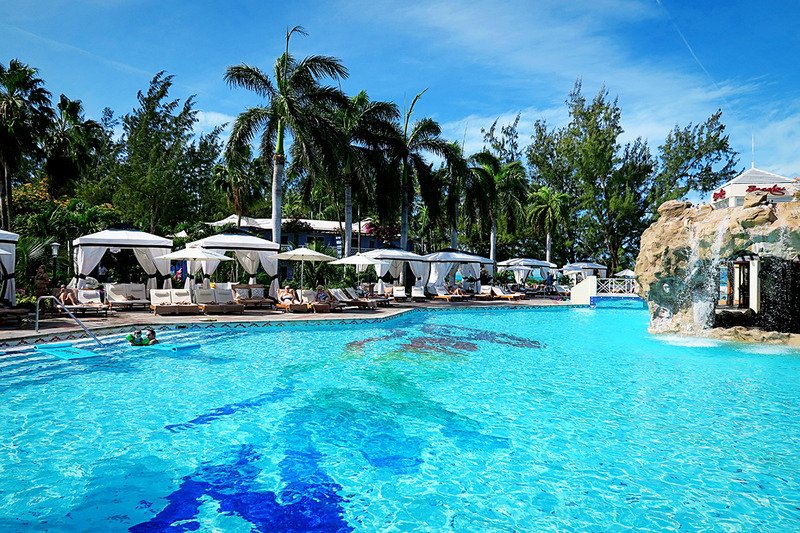 A Review of Beaches Resort Turks & Caicos. 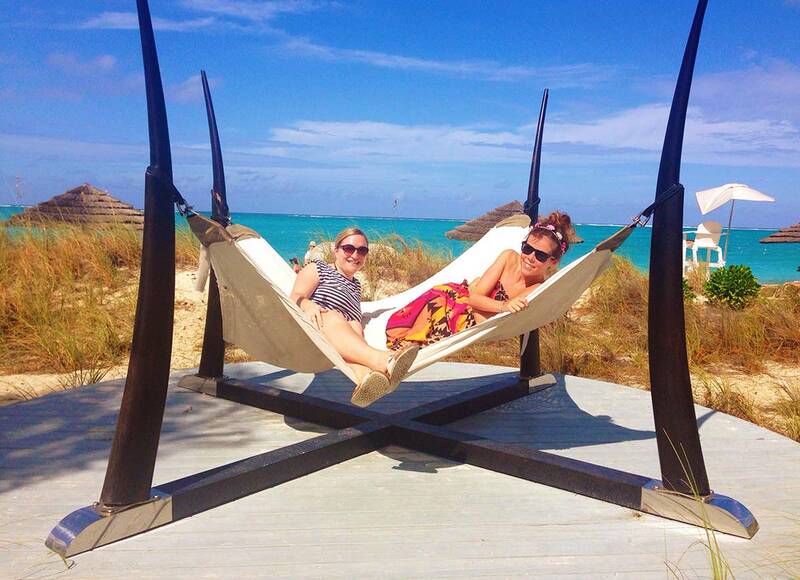 My tan has officially faded but I have finally got round to writing my thoughts about our time at Beaches Turks and Caicos. I wanted to do one last thorough review of our experience in the hope that it will help anyone out there who is thinking about booking a trip to this beautiful place. 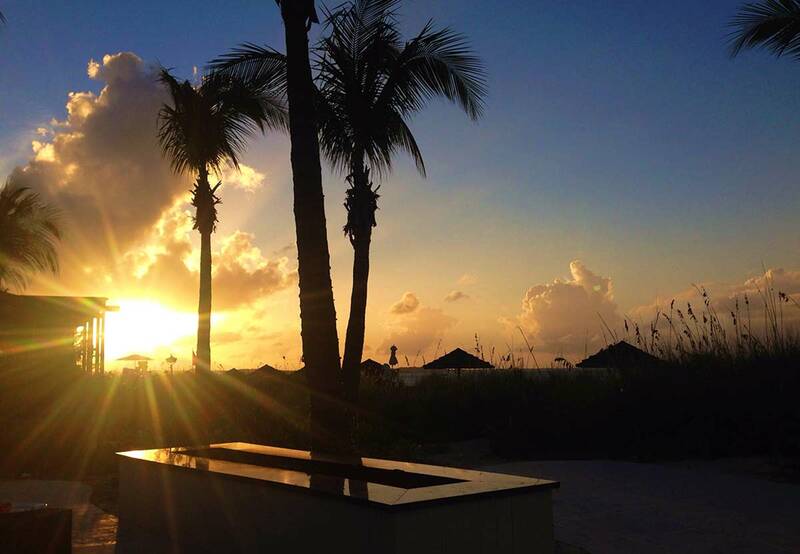 There’s no denying it, Turks and Caicos isn’t just ‘down the road’. In fact at over 7000 miles away from the UK, it is a long journey to consider, especially with young children. I must admit I was a little apprehensive before our flight, but I can honestly say it was fine and I would do it again in a heart beat. You can get to Beaches in a number of ways- you can fly ‘direct’ with British Airways (direct means you stop down in Nassau in the Bahamas to let passengers off first) or via American Airlines from London to Miami (9.5 hours) and then take a connecting flight from Miami to Providenciales. (1.5 hours) Luckily on the way back though you fly in a jet stream so the journey is a little quicker- around 7.5 hours back to London. We booked a hotel package and Heathrow Parking with APH before we went and this helped us no end, as we got transfers to Terminal Three included. On arrival in Providenciales, Beaches organise all transfers and if you are lucky you will get a friendly and informative driver like we did. A few people have asked me about how I coped flying long haul with small children, but I can honestly say it’s a lot better than you would think- all major transatlantic airlines will have in flight entertainment with movies, tv shows and games, and I pack ‘plane goody bags’ for my girls on each flight we go on, plus of course we have the iPad and snacks too. The flight is long but worth it for the paradise you will find at the end of your journey. It was dark when we arrived at Beaches and at this point we had been up nearly 23 hours, so we didn’t get much of an impression of the place until the morning, although we did enjoy the frozen rum punch given to us on check in- that went down a treat. 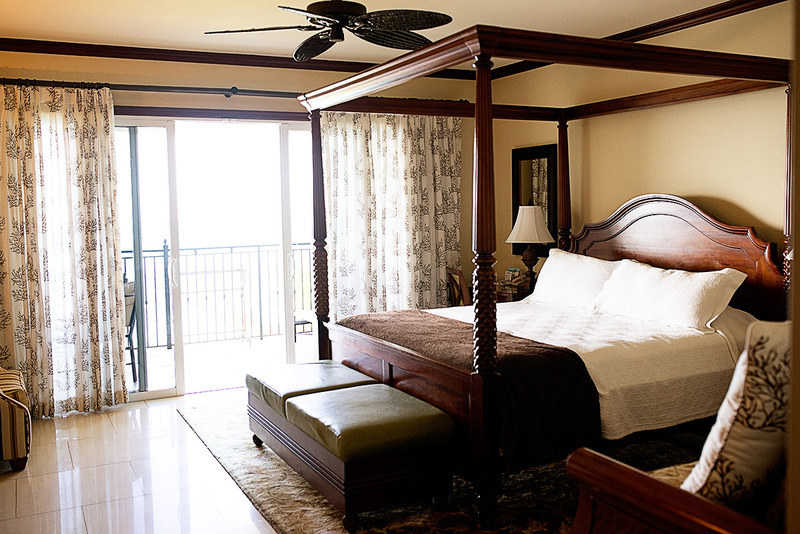 There was an initial mix up with our rooms, but by the morning time the resort manager had sorted it out for us quickly and efficiently, and we got the wow factor on arrival at our room in the Italian Village- an Italian Oceanview Concierge Family Suite With Kids’ Room. The view from our balcony was absolutely out of this world. As a family with two young children, we often like to try and stick to routine as much as we can. Of course, we are on holiday, we have late bedtimes or missed naps, but for the most part as any parent with toddlers will know, if they are over tired then it’s not much fun for anyone. So we really value having an extra space in the accomodation we stay in, as it means if we have to stay in the room from 8pm, we can at least have the television on or chat without worrying about waking the girls. 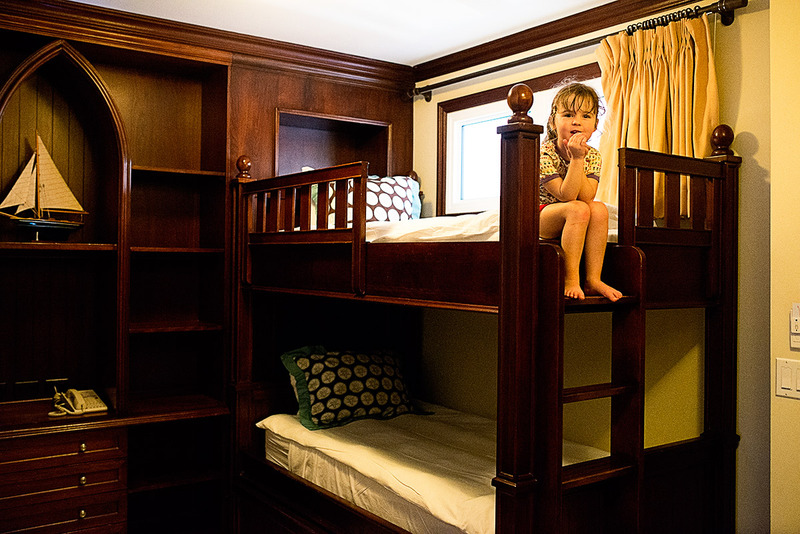 Our room at Beaches had a separate room for Mads and LL, and Mads loved the bunk bed set up. (We had a cot for LL) There was even an X Box and little TV in there for older children. Our suite wasn’t the best room type at Beaches, there are some absolutely extravagant out of this world room types, but it also wasn’t the most basic- it was perfect for us and the view really was so special. That is the beauty of Beaches, with four villages and forty four room categories- you are bound to find the perfect room type for whatever your budget. You can go and eat anywhere, sunbathe anywhere or use each of the village’s facilities, but they have done a very clever job of making each of them feel quite different and unique in style. There’s the Caribbean Village, where you will find the most afforable room types (but also villas too), the French Village, the Italian Village and the Key West Village. Each village has it’s own pools, facilities and restaurants, and definitely their own ‘vibe’ too- the Key West village I would say is more suited to adults and has that beachy, chilled out vibe, the Italian village is more lively and more suited to family fun, the Caribbean is a bit of both and so is the French. Their are plus points to all and that’s what makes it so fun to explore. Our first impressions when we first went around the grounds on our first morning were ‘Wow’. Set in 75 acres, Beaches is large, beautiful but yet somehow retains a friendly and intimate feel. 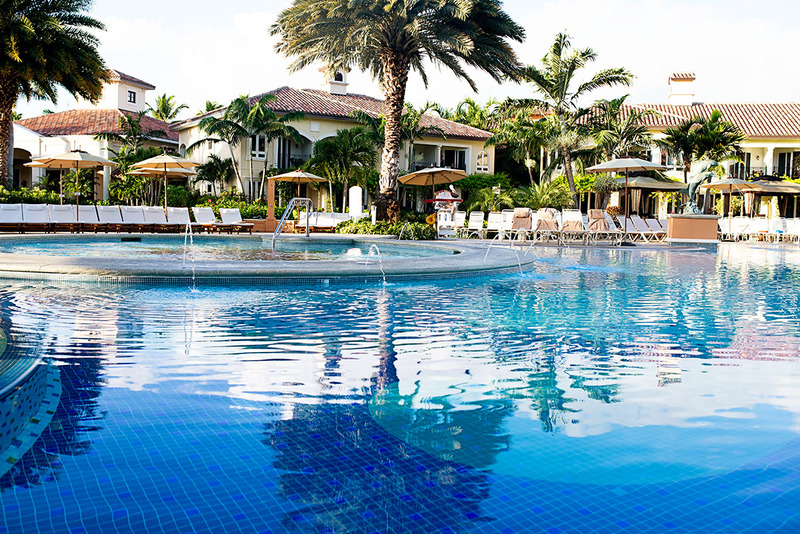 Quite simply, you feel like you are part of a special and exclusive club, even though the resort is large. The resort was busy while we were staying, but it never felt overcrowded and that’s what made it special. On walking around the first morning, we marvelled at all the different villages and their pools, the manicured gardens with their little secret nooks of hammocks and comfy cabanas- and just the way that every single staff member who walked past you said hello and asked you how you were. 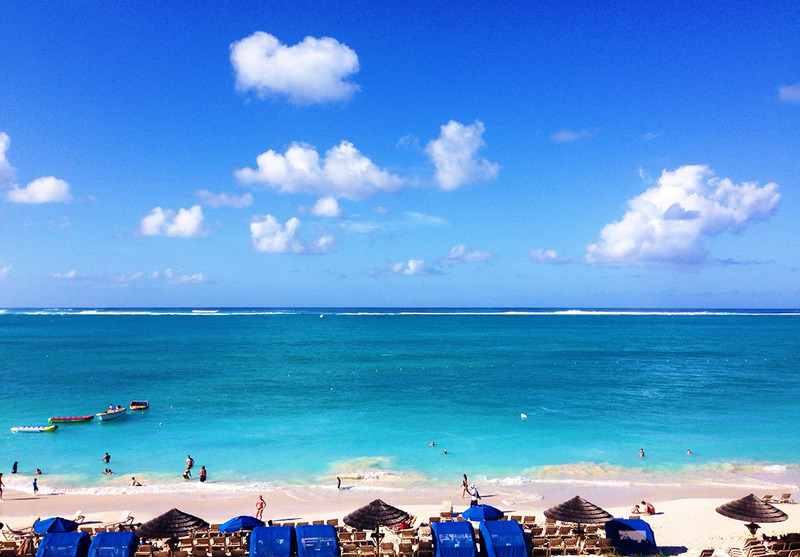 And how can I describe Grace Bay, the beautiful beach that Beaches Resort sits on? It was absolutely breathtaking, with crystal blue waters and the softest sand I have ever set foot on. I have been lucky enough to travel to many places, but I was in awe of the beach here. All the villages, bar the French one are situated on the beach (obviously they go back so not all rooms or villas have an ocean view) but even with the French you are only a few minutes walk away. I think a testament to any resort or hotel is the fact that after a few days you don’t get an itch to leave and explore other places. And we didn’t with Beaches. We stayed in the resort the whole week and I didn’t feel like I was missing out on exploring other parts of the island. We came for a relaxing family holiday and to spend time together, and that’s exactly what we did. In abundance. There is so much for the whole family to do, that I don’t think I will be able to do it justice by talking about it. First things first the main thing to mention is that Beaches is ‘luxury included’. This basically means all inclusive, but it’s a bit different to the ‘bogstandard wine’ and ‘all you can eat buffet’ concept that some people think of. Beaches pull out the stops to make sure that there are no hidden costs, there are premium wines and spirits, and lots of different dining options. Oh and did I say there are nineteen restaurants? But more about that later as that is important! Everything is included, even down to the Watersports. There are all sorts of things going on, including Kayaks, Paddleboards, Aqua Trikes, Hobie Cats and Snorkelling. We tried the Snorkelling and it was great fun. 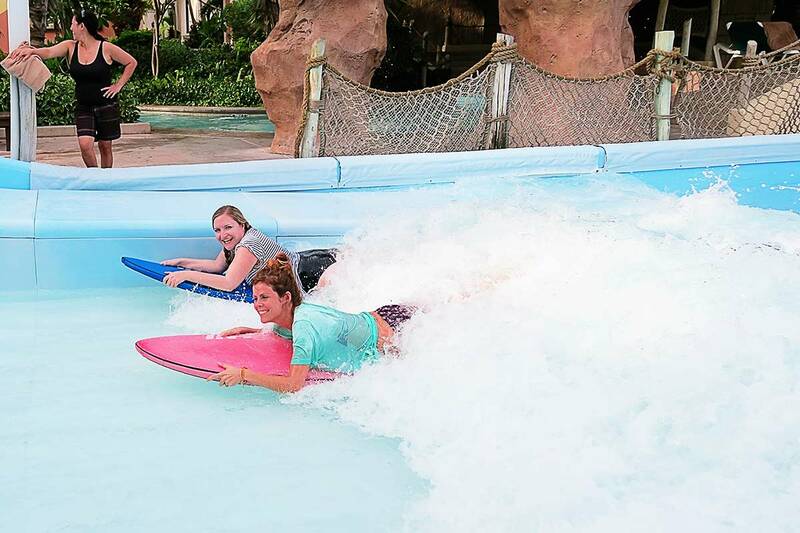 There are ten pools, a couple in each village, and Beaches very own Pirates Island Waterpark (complete with lazy river, numerous slides, a swim up kids bar and a surf simulator) which is just the best thing ever for children and adults alike. You soon figure out your preference with the pools- we loved going to the Waterpark pools for family fun, the Caribbean Village pools for a mixture of fun and a bit of relaxing, and I loved having a afternoon siesta at the Key West Village pools, which I would say are slightly more suited to a bit of adult only time- although kids are allowed there if you want. Each pool has a swim up bar which is just so cool and fun for the little ones- and for the adults. Mojitos in the pool? Go on then. The Italian Village pool- we found this to be the liveliest and also the busiest, it was quite hard to find a sunbed here, but it had great atmosphere with lots of music and fun. One of Caribbean Village pools (there are two of them) was a sort of inbetween- a mixture of cabanas and a bit of luxury, but with fun, music and family friendly fun. 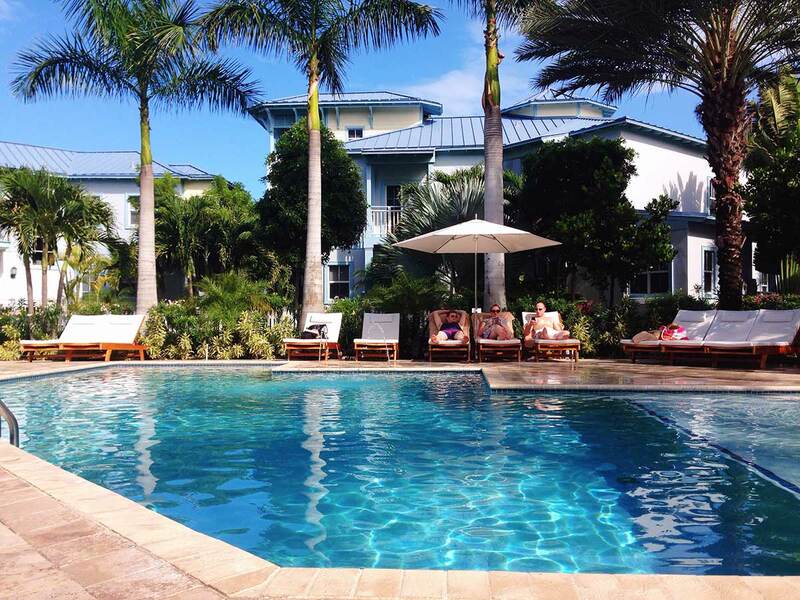 The Key West pool was quieter, more laid back and more suited to a snatched moment without the little ones. When the girls were napping in the afternoons with Mr E who also likes a siesta, I would come down and read my book and it was bliss. Aside from the water based facilities, there are all sorts of things of things going on. 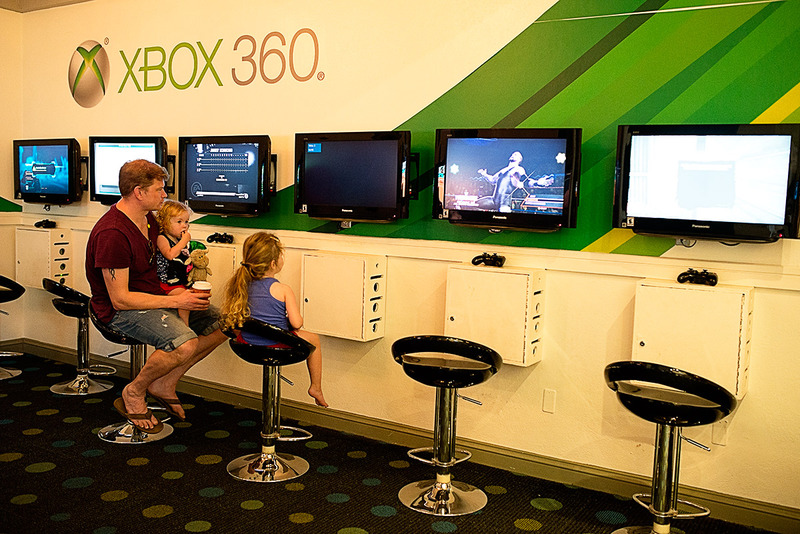 There is a rather incredible X Box Lounge, full of, you guessed it, X Boxes with all sorts of games. Obviously I have very small people, but I can absolutely guarantee that Beaches would be out of this world for tweens or teens. They have all sorts of activities going on for them and I can imagine they would have had an absolute blast. There is also pool tables, a games rooms and even a nightclub for goodness sake. We didn’t go to the nightclub. I’m too old. As mentioned above, there were just so many activities that both adults and children could enjoy and we soon got into a little routine of what worked for us. 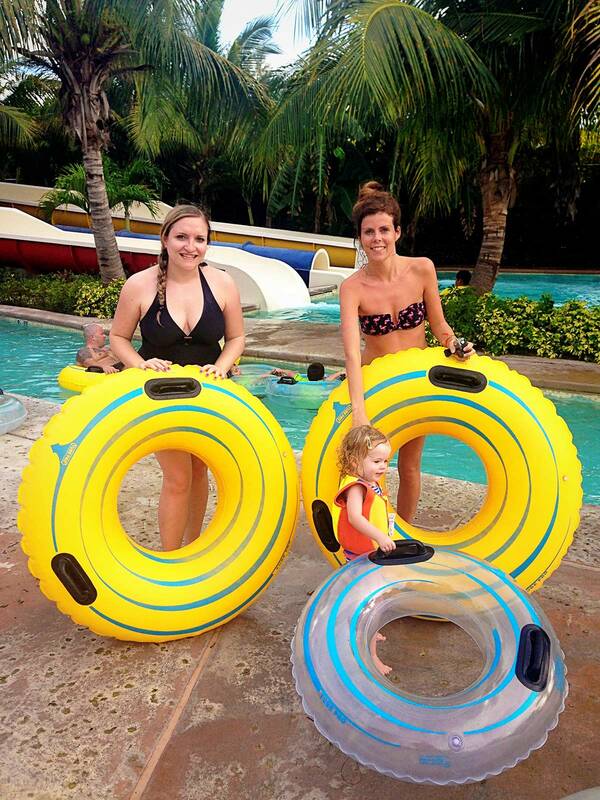 We loved going to the waterpark- it was so much fun having something like this in the resort. The girls loved the slides and the kids swim up bar, and Alison and I even had a go on the surf simulator. (We were both terrible at it but I was worse!) We also did some snorkelling, and the team down on the waterfront directed us to an amazing spot about twenty minutes walk up the beach. There are all sorts of activities at Beaches, including exercise and fitness ones, games, and different things that you could do during the day- like tie die t-shirt fun, volleyball and games. Looking so cool on the surf simulator. The beauty of Beaches is you could do as little or as much as you want. If you wanted an active, fun, action packed holiday then it had that in abundance. If you wanted to chill, read your book and reflect from the comfort of your sun lounger, then you could do it without being interrupted. (except by one of the staff offering to get you a cocktail!) There really is something for everyone. I had the perfect mixture of fun with my family and making memories to last a life time, to a bit of time to myself to relax and reflect. Entertainment wise Beaches delivered yet again. What they do so well is create an atmosphere that means you can quite happily dance along with Elmo and friends one minute, then walk less than five minutes away and be in a relaxing spot having a drink looking out at the waves. They manage to balance this perfectly and it therefore means you get the best of both worlds. There was entertainment on every evening, from regular Sesame Street stage shows, (my girls absolutely loved them!) dance parties where we all danced along to Gangham Style, to cocktails in front of a band while snuggling in front of a fire. And if you dug even deeper there were quizzes, chocolate fountains and open air movies, all included in the cost of course. There was also a weekly Sesame Street parade where all the characters put on a show down the resort’s driveway- that was amazing too. Entertainment wise there are two particular evenings that stood out for me. The first was on the first evening when we went to the weekly family Beach Party. 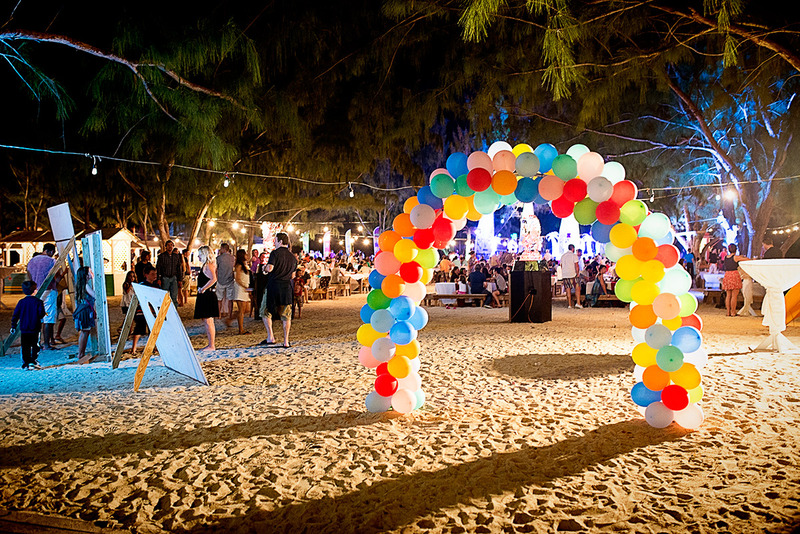 This was like a mini festival wiht lots of twinkling lights, a laid back atmosphere, and was truly amazing- there were lots of different food stands serving the tastiest BBQ food, face painting, a bonfire with marshmallows, limbo, ice sculptures and a stage show while sat on the sand. I only wish it had been a bit later in the week as my girls were still so tired from our journey the day before, but it really was great. My other favourite thing to do was to go to something child friendly, like a disco or a Sesame Street show, then go to have dinner in one of the restaurants and then head to Bayside. Bayside was in the Key West Village and overlooked the ocean. In the evening it had a much more laid back atmopshere than the other villages and they had live music in front of the fire pit. I loved going down there when the girls were a bit sleepy and quieter and sitting in front of the fire listening to music and having a drink- on a couple of occasions I had tears in my eyes because there literally was no where else in the world I would have rather have been. It can be a bit daunting when you arrive at Beaches- you wonder if you will ever find your way around and get the most out of your holiday, but you soon find your way, and there are entertainment boards dotted about so you can see what’s on. They also leave a piece of paper on your bed each evening in their turn down service so you can see what’s on the following day. Watching the sun set at Bayside bar. I am not sure really where to start on the food at Beaches. Firstly I put on at least a few pounds while I was there and haven’t lost it yet. (thanks Beaches!) As I mentioned there are nineteen restaurants and you will want to try them all, but you soon find your favourites. As I previously said, Beaches is Luxury Included, meaning that you can basically leave your purse at home (unless you want to purchase stuff from the gift shop or do an excursion) It is a strange concept going into all the different restaurants and not paying. Each village has a few different restaurants in it and there are a mixture of buffet style and a la carte. 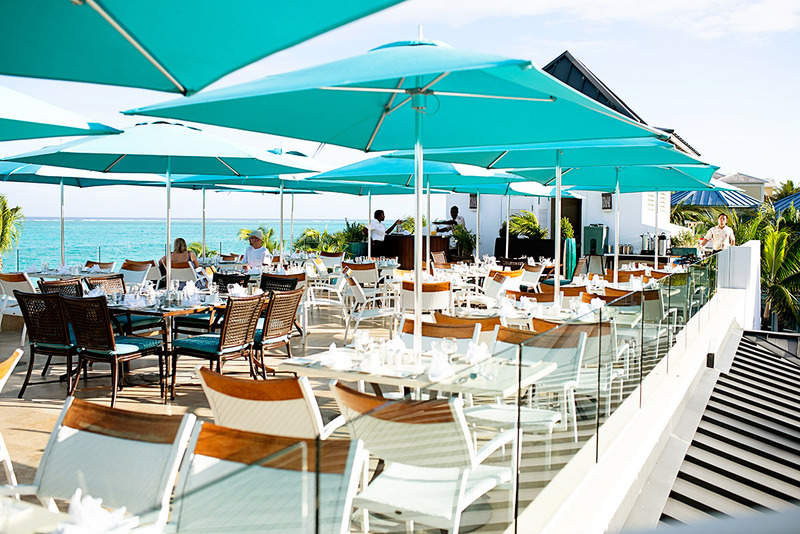 For breakfast my favourite restaurant was definitely Sky Bar, which is above Bayside in the Key West Village. 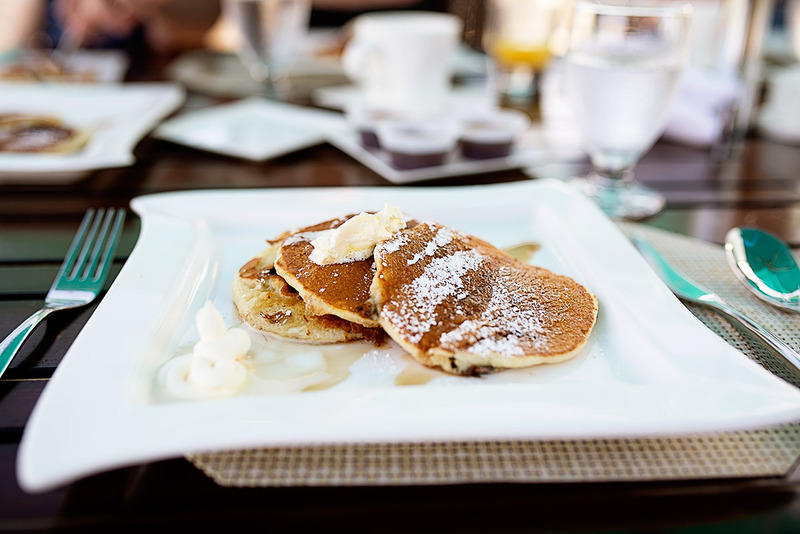 It was a menu based breakfast dining option rather than a buffet and they made the most delicious pancake stacks- chocolate chip, mandarin and blueberry. It’s making me hungry just thinking about them. If you prefer a buffet option, there’s loads of them- we ate breakfast at Marios in the Italian Village a few times- Mads loved the waffles, cereal choices and of course the pastries! You can’t be healthy on holiday, but if you wanted to there were healthy options like fruit and continental, or cooked breakfasts too. For lunch, we all really loved Bella Napoli, an open air pizza restaurant in the Caribbean village. It had a laid back vibe and the wood burnt pizzas were delicious. They also do take aways and you can take them over to eat them by the pool or back in your room. 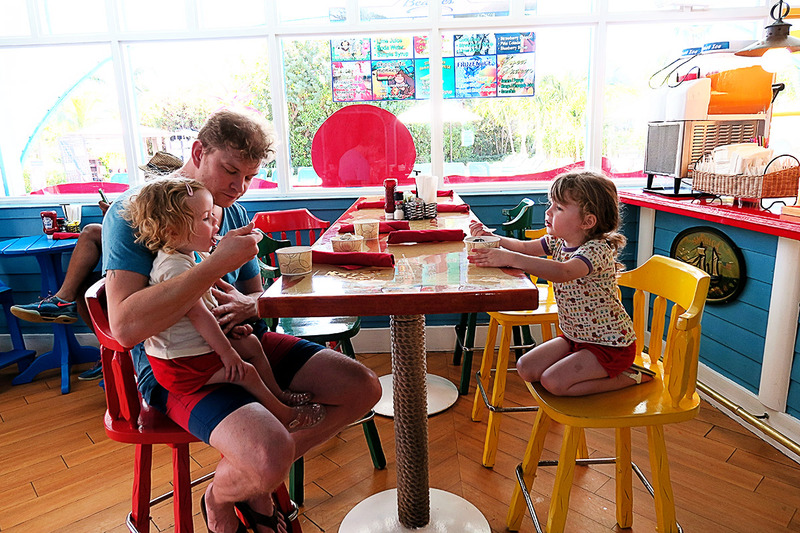 We also all loved Bobby D’s- an American style diner in the Waterpark, they did typical things like hot dogs, burgers and the tastiest pulled pork sandwich which I had on a couple of occasions! It’s here where you can also sample the ice cream parlour- the girls loved this and unlike many resorts you could tell it wasn’t ‘cheap’ ice cream- the cookie dough flavour was delicious, and we loved going there for an afternoon treat. On the last day we tried Arizonas Tex Mex restaurant in the Caribbean village and we all loved it- there was a great choice of things like jerk chicken, grilled meats and other things, we wish we had gone earlier in our stay. Enjoying an ice cream in Bobby D’s ice cream parlour. Dinner again, we were spoilt for choice. We tried Kimonos, the teppanyaki restaurant where they cook the food in front of you. I would definitely recommend trying this once as it was a great, fun experience, although for my fussy children there wasn’t much they would eat. Barefoot by the Sea in the Italian village was an amazing seafood restaurant, this was Mr E’s favourite, there was a great choice of fish, and yes it is on sand so you go barefoot if you want too. My favourite restaurant for dinner was Bayside in the Key West area- this was a buffet style restaurant but it was a great quality buffet and we were spoilt for choice each time we ate there. I loved the open air setting looking out on to the beach and it just had such a laid back style- I really felt so peaceful and happy there, there was live music playing each evening. Drinks wise, you again are spoilt for choice. Beaches does premium branded wine and spirits rather than the rather untasty drinks you can get in some all inclusive properties. There are lots of bars dotted about, including lots of swim up ones which we all loved, and the frozen cocktails especially are delicious. We loved getting ready and coming down for a couple of drinks while the sun was setting. I am actually getting sentimental over a frozen daiquiri- oh to be back there sipping on one of them now. 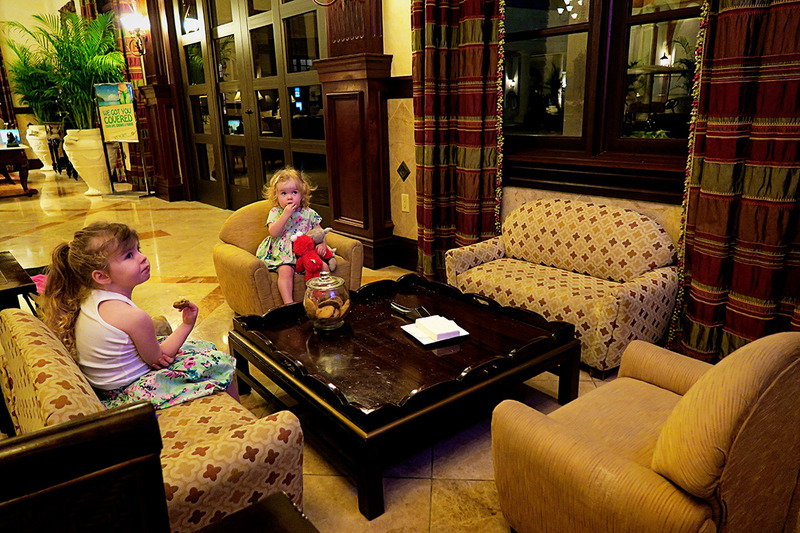 Our girls especially loved the Octopus Bar in the waterpark which was a swim up bar more geared towards children, while again I couldn’t rave more about Bayside, with it’s big love seats and hammocks over looking the ocean and a cosy fire pit with live music in the evenings. The swim up bar in the waterpark- my girls loved this! There are also things that cost a little more- like the Sesame Street Tuck in, the Character breakfast and the Sesame Street Sail Away, the latter of which can be booked through Island Routes Caribbean Adventures which is Beaches excursion partner. The tuck in is where your favourite character (you specify when you book) comes in to your room to read your child a bedtime story and give them a little toy. This was incredibly special and it actually made me cry to see my children have such a special experience- they were in awe of Elmo and were hugging him. It was very sweet to watch. The Character breakfast is where you have a normal buffet breakfast but with a Sesame Street theme- it’s bright, colourful, with loud music and Sesame Street plates and bowls, and of course all the characters are there. It’s a great atmosphere and there’s dancing and lots of fun, and we actually thought this was the best value for money as all the characters came round to see you. Then finally the Sesame Street Sail Away is a trip on a catamaran with a few of the Sesame Street characters- this was also incredibly good fun and I loved watching my girls dancing around and having fun with them all. 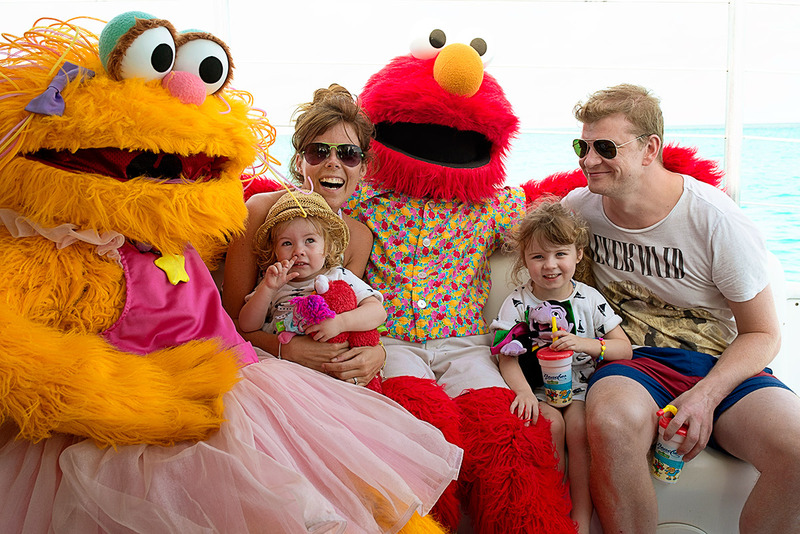 On the Sesame Street Sail Away catamaran cruise. The beauty of Beaches is that if Sesame Street isn’t your thing, you can easily avoid it, it isn’t everywhere or shoved in your face. There are loads of other things you can do – there’s discos for the little ones, a really great playground, daily activities and of course the waterpark too. 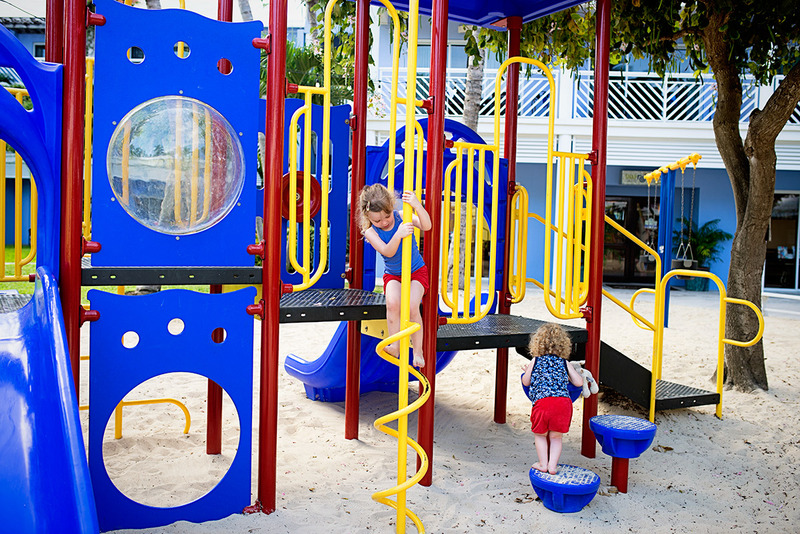 I don’t think my writing will do justice as to how much there is there to do for kids, but if you head over to Space In Your Case Alison and I wrote down 50 things for kids to do at Beaches Turks and Caicos. 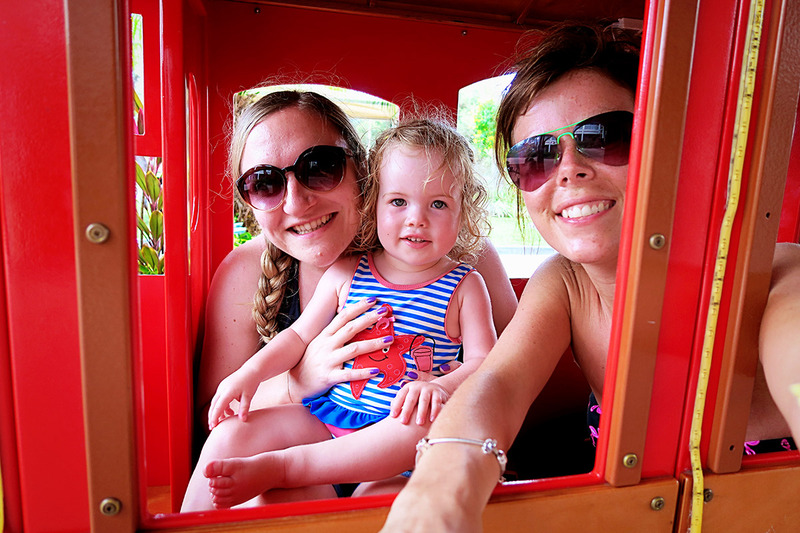 A couple of little things to mention- there is a train that goes round the resort every half an hour, the girls loved this, it was so cute! They also loved the mini table and chairs in the Italian Village lobby- there was a television there showing cartoons on loop and also a jar of cookies- we loved going there for half an hour to get out of the sun- it’s small things like this that make a holiday more fun- Beaches really has thought of everything! Mini chairs and table for mini people! Loving the choo choo train! Beaches offers childcare in the form of Camp Sesame for the little ones and then other programmes for tweens and teenagers. I am very new to the world of childcare on holiday, something that we only tried when we went to Rhodes last year, and which actually made that holiday for us. I was thinking that we would put our girls into childcare a few times when we went to Beaches, again perhaps for morning sessions. We actually only ended up putting them in twice and there are a number of reasons for this. The first one is quite simply, we didn’t want to because we were having too much fun. 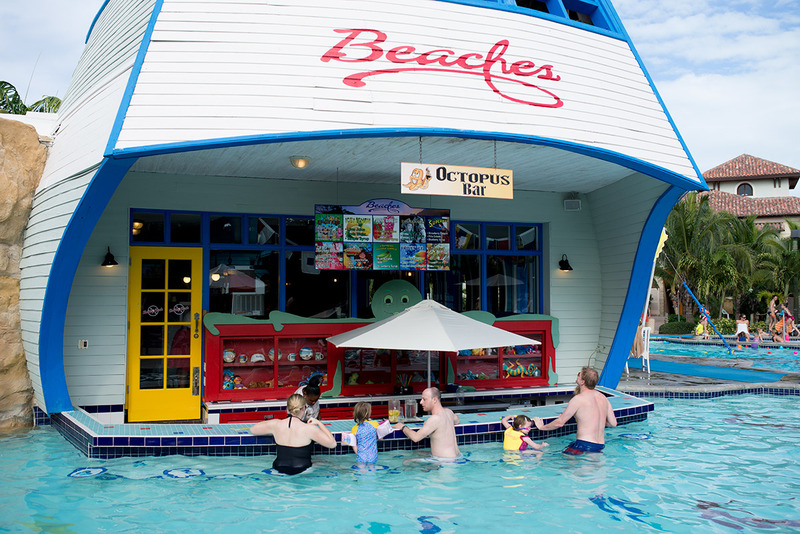 Had we been there for two weeks, or if they were a bit older and wanting to hang out and make new friends then we may have felt differently, but there is just so much to do at Beaches for families, that we wanted to be with them and spend time with them. We felt we were missing out by putting them in there! We did put them in twice, just so we could have a couple of hours sunbathing and quiet time, and we found the process to feel quite safe and efficient- you signed your child in and out, with a password, and they also gave you a mobile phone so you could contact them or they could contact you while you were around the resort. The girls seemed to have a good time while they were there, but I must admit I didn’t feel as comfortable with the childcare as I did the previous time we used it on our holiday to Rhodes. I can’t put my finger on exactly why, the staff were friendly and seemed efficient, and there was a huge range of things for them to do, (including their own little pool in the childcare area) but I just didn’t like the process quite as much. I think it was mainly things like on our previous holiday, each child got a key worker and they really got to know them over the course of the week, they were quite affectionate and friendly with them, whereas with Beaches I felt like the staff weren’t quite as welcoming or forthcoming in putting the girls (or us) at ease. That said, like I mentioned my girls really enjoyed going and came back with some lovely tales of the fun they had- including baking cookies with Cookie Monster and other fun things. Had we been there for longer, I would have taken more advantage of it, but just for a week we were happy with the time they spent there. 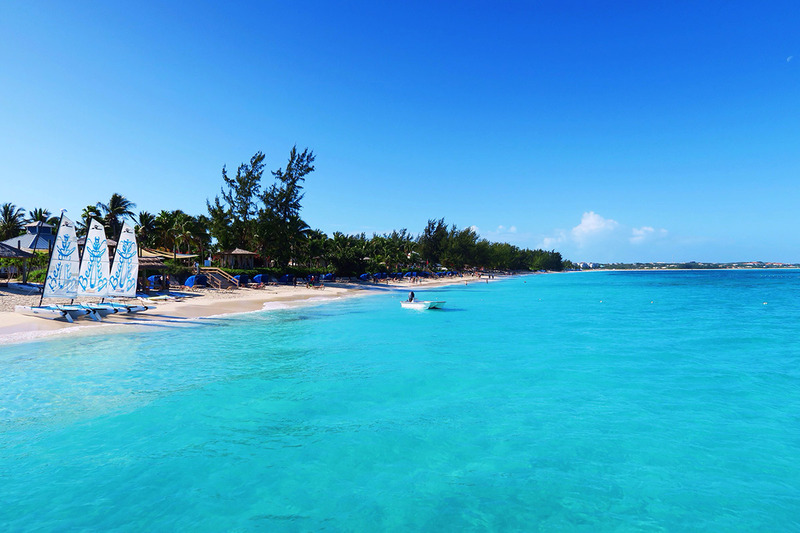 Without a doubt Beaches Resort Turks and Caicos is one of the best places we have visited as a family. The resort is out of this world, the faciilities are incredible and there is so much you can do as a family. The Turks and Caicos islands are just absolutely stunning, and so many times I had to pinch myself that we were there enjoying such a memorable experience. Beaches has a great knack of making you feel incredibly special, especially considering it was such a large resort. There really isn’t anything negative I can say about it, which is a testament to the place. I think if we were to go back, I would stay for at least ten days next time, only because it is such a long way to go for a week, although we all said that it felt like that we had been there a lot longer than seven days- we packed a lot in and made a huge amount of memories in that time, and it felt like we had really experienced a lot in a short space of time. I think it’s the type of place that you can’t really explain or do justice when you are writing about it- it needs to be experienced in order to fully appreciate just exactly what makes it so special. We had an incredible time and I hope one day we will be able to go back there- it makes me feel sentimental just thinking about it. It was such a special trip and I couldn’t recommend it more. Massive thanks to Beaches for inviting myself and my little family to stay for the week. 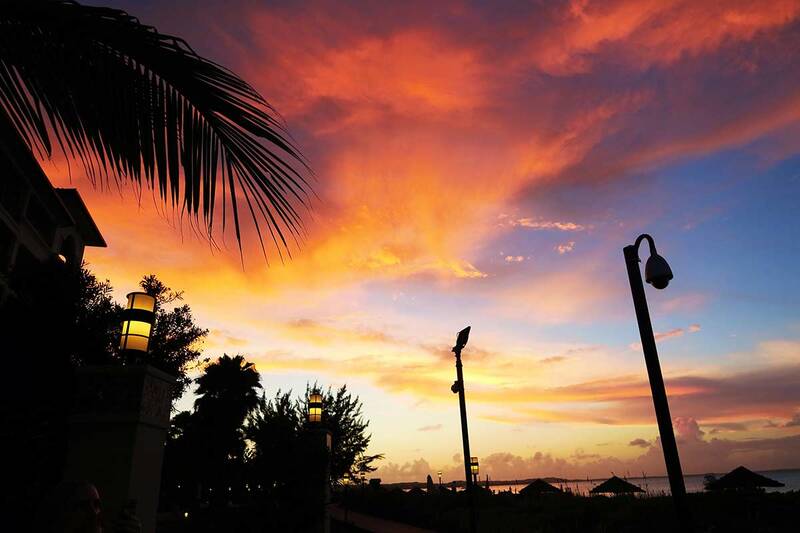 All photos, words and opinions are entirely my own, we really do think that Beaches Turks and Caicos is the most incredible place for families. Oh Katie it truly is a stunning place in the world and with your beautiful family in it. Paradise! Sounds and looks like you made the most of flying across the world with your little ones in tow. I know all too well what that’s like. But this on the other end I would do it anyday Magical and worth it. Love all your photos babes. It looks amazing. It sounds amazing. WOW to your photos. PS you look so beautiful and your tan is gorgeous. Oh I literally cannot wait to go to Beaches! Negril looks just as lovely and I love the brilliant functionality of the suites – so important for families to be able to be flexible. I’ve had some good conversations with the managers and chefs there about our dietary requirements too. I love that the resorts are so keen to make sure everyone has everything they need for a brilliant stay. So want to go! And I LOVE your bikini where’s it from? Wow, wow, wow! It looks and sounds amazing. I had a little look at the website and prices and nearly choked on my diet coke BUT after reading this and what all is on offer, the price seems to be well justified. It sounds like you wouldn’t need to spend another penny when you are there! Gorgeous pics as always and gorgeous memories made…and hey what price can we put on that?! Thanks Laura- it was such a beautiful place. Oh wow, those pictures, the blue skies and the blue sea, fantastic! Seriously – This is just perfect! It would be more dream holiday & we have already started saving up for this because of you. Wow, this just looks amazing! Your pictures are gorgeous, I remember seeing them on IG at the time, so it is great to read all about it! It looks so, so amazing. I bet you have to pinch yourself to believe you were actually there. I just can’t get over the flight at the moment though. My two are good boys but they do not sit still. Ever! I think the eldest might just about manage it if there’s enough tech for him to gorge on but the littlest? He’d go stir crazy. We’re planning long-haul in 2016 though as we have to head over to the US to meet up with some friends from Texas. I’m debating whether a week in the Caribbean might be a nice add-on if we’ve already gone 80 percent of the way.